This is a guest post written by a Guest author of blogtipsntricks.com. Also See How To Become a guest author on BlogTipsNTricks. Google (www.google.com) According to website ranking utility Alexa.com, Google is not just the "Big Daddy" in SEO circles for web developers, it truly is the #1 site on the web. Many search engine experts will tell you that once you get listed on Google, everything else will fall into place. What they mean by that is, a Google listing will get you picked up by all the lesser engines, giving you more visibility, traffic and popularity across the web. Take your time and study the rules and guidelines published at Google to maximize your results and use other Google tools to boost your listing. Bing (www.bing.com) It's hard to be #2, but Microsoft has done a good job of making Bing a solid #2, despite its #22 ranking on Alexa. Not as popular or widely used as Google, Bing is still worth the effort of studying and submitting. The more opportunities you give your site to reach out to your target demographic, the better. Yahoo! Search (search.yahoo.com) Yahoo! 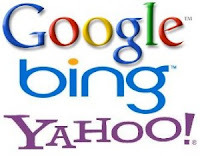 is separated into two distinct parts: the original Yahoo!, which is a directory and not a search engine; and Yahoo! Search, which actually is a search engine. It is a good idea to submit your website to both parts, taking care to adhere to any rules that may apply. Ask.com (www.ask.com) Ask a question and Ask.com will give you an answer. This boolean search engine will help you find the answers to all your questions, or will at least give you a bunch of links trying. Ranked at #52 on Alexa, Ask.com is not top of the list, but it still commands a lot of traffic and consumer interest. AOL Search (search.aol.com) No, seriously - AOL still exists and there are still AOL users out there, enough in fact for AOL Search to rank #5 on this top list. Many people still have AOL news and search as their "home page" in their browsers, so it pays to submit your pages to AOL Search. Blekko (www.blekko.com) This self-described spam-free search engine is powered by the same web bot used at DMOZ a popular human-checked search directory. No actual submission is required, but you will need to allow Blekko to search your sit, and an email contact is provided to help expedite crawling and listing. When chuka Udeze isn’t working on his computer, he's busy reading every technology article he can get his hands on.